Watford XI: Gomes; Nyom, Cathcart, Prödl, Anya; Capoue, Watson; Abdi, Deeney, Jurado; Ighalo. Joyous scenes from the Watford players as they depart the pitch. Newcastle have now won only three of 25 Premier League games in 2015. Oh dear. Safe trip home if you've been at the game. See you soon. And that's it. A famous win for Watford, who achieve successive Premier League wins. A very telling time for Newcastle, who start this season in much the same way as last. It's all looking pretty desperate for Newcastle as they can't find their way through Watford's defence. Watford defending for their lives as two Newcastle crosses are cleared in succession. Four minutes of added time. Time for a goal? Jack Colback goes into the book for a foul on Odion Ighalo despite replays showing he might have got the ball. Soon after, Allan Nyom skies over when well placed after a smart run. 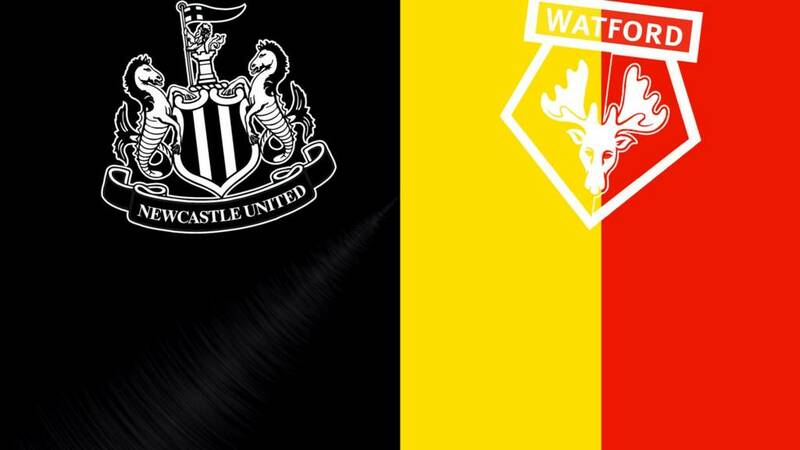 Last change for both teams as Watford's Ben Watson is replaced by Adlene Guedioura and Newcastle's Gabriel Obertan comes on for Florian Thauvin. Daryl Janmaat is OK then. Daryl Janmaat is in a spot of bother with cramp. He's certainly shown his appetite to get Newcastle back in the game today. Etienne Capoue is booked after bringing down Georginio Wijnaldum. Soon after Newcastle fans appeal for penalty as Ayoze Perez goes down in the area, but it looked like he lost his footing. A change for either side as Watford's Nathan Ake replaces Jurado and Rolando Aarons comes on for Newcastle's Massadio Haidara. Georginio Wijnaldum bursts down the inside right channel, feeds Siem De Jong, but the striker's shot is straight down the throat of Heurelho Gomes, who has had a busy afternoon. "McClaren has a lot of work to do"
"All credit to Watford, who look like they have deserved this result, though I'm really frustrated by the Newcastle performance. They have been poor, there has been no cutting edge and Steve McClaren has a lot of work to do." Watford attacker Almen Abdi is replaced by Steven Berghuis as Allan Nyom bursts down the right but cannot find a Watford player with his low cross. Frank Meehan: Surely the rule amongst football managers is never manage Newcastle. Why did McClaren? Always going to be a disaster. Florian Thauvin leads a Newcastle charge, but pulls his shot well wide from 25 yards. Newcastle need a goal, and soon. Troy Deeney has been a colossus today for Watford. Odion Ighalo may get the headlines, but the Watford skipper has been an inspiration to his team-mates as he harries the Newcastle defence once more. "The atmosphere is a lot more positive inside St James' Park now." Janmaat has "a bit of bottle"
"Daryl Janmaat is one of the few players in the Newcastle side that has a bit of bottle, a bit of something about him. Newcastle are in trouble and he is trying to affect the game." Daryl Janmaat leading Newcastle's riposte single-handedly now. His cross is just flicked wide by Siem De Jong. Daryl Janmaat has a taste for this now. He bursts down the right and wins a corner. It's cleared but eventually falls to the Dutchman and he strikes left-footed from 25 yards only for Heurelho Gomes to superbly tip it round the post. Some of the crowd thought that was in. Chance for Watford but as Troy Deeney plays a one-two on the edge of the box, Chancel Mbemba beats the Watford striker to the return ball and pokes it out for a corner, which comes to nothing. Daryl Janmaat scores a second goal of the season, and it's all of his own making. He feeds Moussa Sissoko, continues his run and when the cross comes in he arrives to clip it past Heurelho Gomes. Moussa Sissoko has room on the right for Newcastle but his low cross is cleared by the impressive Sebastian Prodl. The Austrian has had a good game alongside centre-back partner Craig Cathcart. The more Newcastle press for a goal, the more gaps appear for a Watford counter attack. Intriguingly poised now. Florian Thauvin crosses from the left, it finds his Newcastle team-mate Ayoze Perez around the penalty spot, but the Watford defence crowd him out and block his effort. Having relinquished possession to Newcastle, Watford go close on a couple of occasions as Troy Deeney links well with Odion Ighalo, but the Nigerian cannot find his team-mate with a return pass. Dangerous, though. You know what I was saying about those Newcastle crosses? Only one has found a Newcastle shirt, and that was on the other side of the pitch. As I write this, another delivery clips off the head of Moussa Sissoko and runs out of play. You have to wonder what Newcastle midfielder Georginio Wijnaldum makes of it all. Having signed from PSV Eindhoven for £14.5m in the summer, the Dutch side were beating Manchester United in the Champions League in midweek. Nice move from Newcastle, but when Florian Thauvin shoots it is blocked easily by Watford defender Allan Nyom. Ayoze Perez is close to a subsequent cross moments later. More catching practice for Heurelho Gomes in the Watford goal. Newcastle's crosses have not found their targets very often this afternoon. Siem De Jong was signed under previous Newcastle boss Alan Pardew. The Dutchman has scored twice since his £6m move in July 2014, but was injured for most of last season. Meanwhile on the pitch, Troy Deeney shoots for Watford but it is deflected wide. Newcastle striker Siem De Jong comes on for Papiss Cisse as Watford get us under way again. Tom in Kent: Really could be all change in the North East next season. Newcastle and Sunderland swapping places with Middlesbrough? That would be the ultimate changing of the guard. Adam: Is anyone really surprised at Newcastle's current plight? A poor team with no history of success and a manager who has failed in almost every job he has had isn't going to be a glorious marriage, is it? Newcastle started to find their way as the first half ended, but with Watford two goals to the good, it is a long way back. "Problems mounting for Newcastle, but a glorious first half from Watford." Good possession from Newcastle but another Florian Thauvin cross is collected by Heurelho Gomes. And that's it for the half. Two minutes of added time as Newcastle goalkeeper Tim Krul rushes from his goal to clear ahead of Troy Deeney. Watford boss Quique Sanchez Flores is a suave looking fella, and has a positive aura about him as he retrieves the ball. With his team 2-0 up, why not? The hosts win their first corner of the game, it is cleared at the near post and then the second corner is flipped away by the increasingly busy Heurelho Gomes in the Watford goal. Florian Thauvin is looking one of of the more promising Newcastle attackers, but as he wriggles into the box, he passes back to Jack Colback, whose cross is easily gathered by Heurelho Gomes. Watford striker Troy Deeney (number nine) is yet to notch this season but he has now played a part in both his side's goals today, setting up Odion Ighalo to make it 2-0. When you watch replays, it looks a simple goal - a 1-2-3 of a long ball from Sebastien Prodl, a nice take and pass from Deeney and cool finish from Ighalo - but that does not do justice to the neat passing move that preceded it. Steve McClaren is now making a few notes in the Newcastle dugout. His back four needs more protection but at the other end, Florian Thauvin tests Heurelho Gomes with a stinging shot. Watford cannot find a way through on the edge of the Newcastle penalty area and as the hosts break forward, Almen Abdi is booked after he brings down Ayoze Perez. Cynical. Perez then fires over soon after. "This may look familiar to Newcastle fans as their team didn't win any of their opening seven games last season but then won five in a row." "The three teams that have come up haven't struggled as they normally would. Newcastle are all over the place. They are really struggling and it's a sad, sad time for the north-east at the moment". Watford aren't sitting on this at all, they are looking for a third goal and keeping the ball very nicely in their pursuit of one too. Odion Ighalo has had five shots this game, three on target and two goals. Not bad going at all for the Watford striker. For you stats fans, Watford's in particular, that is 20 goals in 24 league games for Odion Ighalo this calendar year. Watford fans at St James' Park are rejoicing. Whoever Steve McClaren was calling, it didn't work. A long ball forward is collected by Troy Deeney, he waits for the run of Odion Ighalo, who times it perfectly and then rounds Tim Krul to grab his second of the game. Nice finish. It must be bad for Newcastle, Steve McClaren is on the blower. To who, though? As much as Watford offer a threat in attack, they also look solid in midfield with Ben Watson and Etienne Capoue offering a good shield for the back four. Capoue is also adept going forward as he lifts the ball towards Troy Deeney, but it is just too long for the Watford striker and Tim Krul comes out to gather. It is safe to say Watford's main threat has come down the left so far. Ikechi Anya and Jose Jurado are linking up well for the Hornets as striker Troy Deeney offers support. "There's a good tempo to this game but a frustrating afternoon so far for Newcastle boss Steve McClaren. " Watford are very good at getting players in support of the man on the ball. Troy Deeney is playing on the shoulder of Fabricio Coloccini and looking a threat, as he curls a shot just wide. Another good chance for Newcastle, but again they are wasteful. This time, Moussa Sissoko cannot steer his shot on goal when it is pulled backed to him inside the penalty area. Newcastle's Florian Thauvin has shown some signs of causing trouble for Watford down the right but his delivery is too deep for Papiss Cisse, who last scored a goal for Newcastle on the opening day of the season in a 2-2 draw with Southampton. "Newcastle now have to respond"
"A well-taken goal. The ball came through a ruck of players so the keeper won't have seen it until late. The problem for Newcastle is now they have to respond. "If Newcastle don't win this game - Watford at home - it'll wreak havoc with confidence." You can enjoy analysis and reaction on Final Score via the Live Coverage tab at the top of this page. Great chance for Newcastle to equalise. Papiss Cisse is put through by Moussa Sissoko but the striker skews his shot wide of the near post. That goal has knocked the life out of St James' Park. Watford fans are in good voice way up in the stands. That's a third of the season for Nigeria international Odion Ighalo, who now has 19 goals in 24 games in 2015. Impressive. Poor defending as Newcastle give the ball away in their own half. The ball is swept to the edge of the box and when it works its way out to Odion Ighalo, he squeezes his shot inside Tim Krul's near post. Great chance for Newcastle in a lively opening. The cross comes in from the right, Watford keeper Heurelho Gomes makes hash of it after it deflects off one of his defenders, but Papiss Cisse cannot convert with the net gaping. Odion Ighalo strikes the first shot of the game but the Watford forward fires wide. He then has an even better chance at the edge of the box but drags it wide of he far post. Ayoze Perez, who sits in the number 10 position for Newcastle today, has a couple of nice touches, but Georginio Wijnaldum's pass cannot find a team-mate. Ayoze Perez bursts down the line for Newcastle right but his cross is too deep. Steve McClaren down in the dugout and looking pensive already. Watford pair Troy Deeney and Odion Ighalo involved early on in the Newcastle penalty area, but the hosts clear. The hosts get us under way on a lovely day in Newcastle. As the two teams walk out onto the pitch and conduct their pre-match handshakes, a reminder of today's line-ups. So, Newcastle fans, have you seen enough for your team to turn their form around or is it another season of struggle? Watford supporters, can you build on the success against Swansea and keep trouble out of arm's reach? Let us know your thoughts via #bbcfootball or the Match of the Day facebook page, or even text us on 81111. "With Chelsea and Manchester City games to come, even at this early stage of the season, it is tempting to describe this as a must-win match for Newcastle. "Watford gained their first victory at the expense of Swansea last weekend, but the Hornets have only managed three goals on their return to the top division. It may not be a high-scoring match at St James' Park but it will certainly be a tense one." Despite AC/DC's Thunderstruck firing its way out of the tannoy system, it's warm and sunny up at St James' Park. Let's get a word from our match of the Day commentator John Roder. With only five goals between these two sides so far this season, recent history does not suggest a glut. But in Watford striker Odion Ighalo, who scored the winner against Swansea last weekend, the Hornets have a forward who has the best strike-rate in England in 2015. Newcastle boss Steve McClaren makes one change to the team which lost to West Ham last Monday. Ayoze Perez comes in for Vurnon Anita, meaning Georginio Wijnaldum drops back into a holding midfield role as Perez starts behind striker Papiss Cisse. With Valon Behrami suspended following his red card against Swansea, Watford manager Quique Sanchez Flores also makes one change, bringing Ben Watson into midfield. Newcastle have had "a really poor start"
"Newcastle have been missing leadership from the back of the pitch. It has been a really poor start from them this season." But can facing newly-promoted Watford provide Newcastle with a route out of trouble? The Hornets, who came up after finishing second in the Championship, only secured their first win of the season against Swansea last weekend. It was a huge relief for Watford boss Quique Sanchez Flores. Now he has a taste for it, can he fulfil his wish of aiming to "silence" St James' Park? Newcastle boss Steve McClaren's return to the Premier League has not been pretty since he took over in the summer. Two goals, two points, no wins and bottom of the pile. No wonder he's called overhauling the club "a little bit like a car crash".